Our next meeting will be on Monday 3rd June when Cherrill Sands will talk about 'Painshill: the restoration'. Meetings are held in Hall 2, Maybury Centre, Board School Road, Woking, GU21 5HD. Free to members, guests are welcome for a fee of £3. Refreshments are available before and after the meeting. Doors open at 7.40pm for an 8pm start. Dan Allen will talk about Women in the Victorian Army. The talk is free to members and guests are welcome for a fee of £3. Refreshments are served before and after the meeting. Parking is available at the Centre. Doors open at 7.40pm for an 8pm start. 'Cannabis, combined with a stimulant in large doses, rather than small ones, may be given.' A look at drug use in Victorian Asylums. Our next meeting will be on Monday 4th February 2019 when Helen Gristwood will talk about the use of drugs in Victorian Asylums. The meeting starts at 8pm with doors open at 7.40pm for refreshments. Parking is available. If the Centre carpark appears to be full, drive straight through and park in the school beyond. 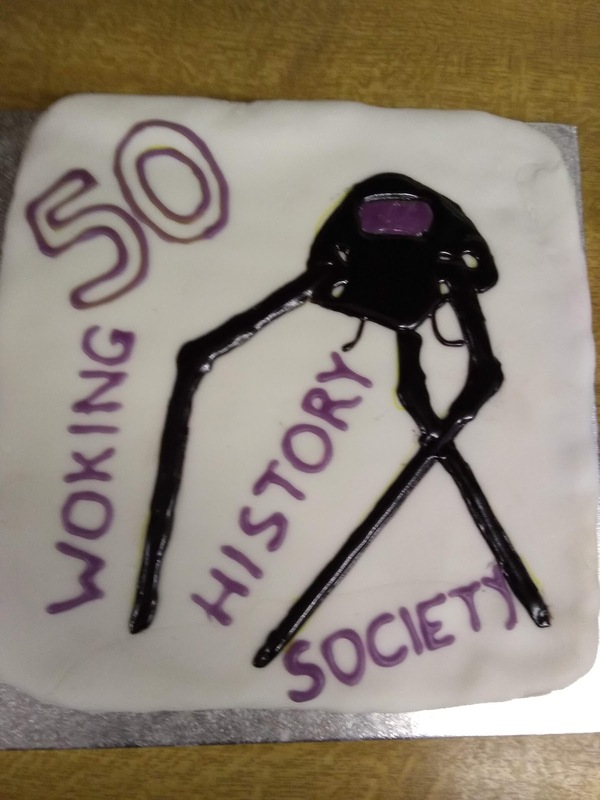 The Society celebrated it's 50th birthday on November 5th with a martian themed cake. The committee gave a series of short talks on aspects of Woking and of life in general in 1968. Our meeting on Monday November 5th will be a celebration of the Society's 50th birthday. There will be a cake, a raffle and a series of short talks by committee members on aspects of life in 1968. This will be our last meeting in The Gallery as the AGM on December 4th will be held in the Skylight Room at Christ Church. Meetings from February next year will be held at the Maybury Centre in Board School Road. David Rose will talk about Woking in the 50s and 60s on Monday October 1st. We meet in The Gallery, Christ Church, Jubilee Square, Woking. Doors open 7.40pm for an 8pm start. Refreshments are available before and after the meeting. Members free, guests are welcome for a small charge of £3. From February 2019, Woking History Society will be meeting in Hall 2, Maybury Centre, Board School Road, Woking, GU21 5HD.